Questioning the societal infrastructure built to dispense ‘justice’ and ‘morality’ is not restricted to any single nation. Headshot, a Thai/French co-production concerned with these themes does so predominantly through perspective and physicality. Opening with striking POV cinematography, introducing its protagonist through first person perspective and then a mirrored image sets up the film’s intent to explore interiority. Positing then the viewer as existing somewhere between aligned with and yet distanced from protagonist Tul, Headshot continues to play brain against braun in what is essentially a decent enough but far from innovative dramatic thriller. Through a physical metamorphosis we see Tul transform from rogue individual to a modest monk. Performing the physical attributes of a monk however has no bearing on saving his ‘soul’. Just as it becomes apparent that Tul is an assassin carrying out a hit, he is shot in the head, falling into a three-month coma only to awake with a literally inverted view of the world. His now altered perspective is 180 degrees opposing his previous belief system as he views the world upside down. A series of temporal interruptions to the narrative fill in the past alongside the present preferencing neither as a true or correct path, leaving final judgement to the viewer. Juxtaposed against one another are the presentations of intellect and physical strength; Tul reads about the conception of evil as originating from genetics and then works out whilst contemplating the merits of scholars and education. Unable to side with either and struggling with each as the narrative unfolds – adopting again the physical life of a monk but never truly able to submit to its ideology and repeatedly theorising his life without killing whilst running, fighting and shooting at his pursuers – Tul has reached an impasse between his body and his mind. 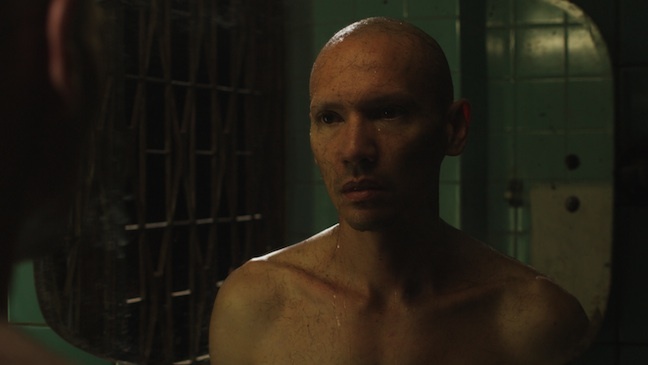 His perspective unable to shift despite the rupture to linear progression and his body constantly trying to heal despite repeated affronts upon it, Tul cannot locate ethics within the moral minefield of Bangkok’s underworld. Interesting though the themes may well be, the film covers well trampled ground and ultimately fails to tread on anything fresh enough to be innovative or truly provocative. Its absence of ethical questioning is difficult to ignore as it contemplates morality only as far as the system’s effect on the individual is concerned without ever really contemplating the Encounter with the Other. A decent if somewhat standard crime thriller. Headshot screens as a part of the 2012 Melbourne International Film Festival with further sessions on Sunday August 5th at 9pm and on Sunday August 12th at 11am.